SSRF advises continuation of conventional medical treatment along with spiritual healing remedies for the treatment of physical and psychiatric illnesses. Readers are advised to take up any spiritual healing remedy at their own discretion. When we consider spiritual healing methods to address a problem we face, there are two generic methods available to us. These two choices apply to all of us who have a problem that has its root cause in the spiritual realm. 1. Spiritual practice: When a person does spiritual practice that conforms to the six basic principles of spiritual practice, he builds his own ability to protect himself against harmful elements in the spiritual dimension. 2. Spiritual remedies: This is where the affected person or another individual performs a specific act to alleviate the affected person’s problem at a spiritual level. The benefit of a spiritual remedy is that rapid relief is brought to the affected person. The downside is that the relief may just be temporary, lasting only as long as the effect of the remedy lasts. Spiritual remedies include Reiki, Prānic healing, application of Holy ash (Vibhūti), application of Holy water (Tirtha), healing through mantras, visiting a faith healer etc. If spiritual practice has 100% effectiveness in overcoming problems in life, then spiritual healing remedies administered by a healer have only 40% effectiveness. The reason for this is that for spiritual remedies, the variables of whether a person can be healed increases as they involve both the healer and the person being healed. Use of spiritual remedies (the second generic method) that involve a spiritual healer generally bring about a symptomatic cure and only sometimes a cure of the spiritual root cause. On the other hand, regular spiritual practice (the first generic method) cures the root cause of a spiritual problem or provides relief from the pain caused by it. Click on this link to understand more about the various spiritual root causes of problems in life. 2 What is the preferred method of spiritual healing? 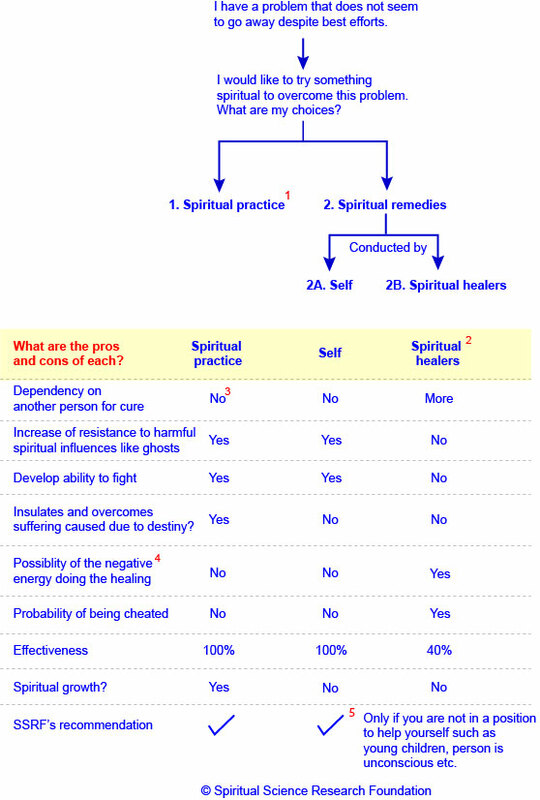 The following flowchart will give you an understanding of the preferred method of spiritual healing from a spiritual perspective. 1. Here by spiritual practice we mean the type of spiritual practice that is universal and conforms to the six Basic Principles of Spiritual Practice. 2. Whatever method one wants to use, if one plans to heal others, it is highly recommended that one needs to be spiritually positive (i.e. free from spiritual distress). This is because as a healer one has a direct influence (physical or subtle) on the person one heals. This includes healing methods where a healer may be required to touch a person or others that do not involve touching a patient, such as Acupuncture or Reiki. 3. As one grows spiritually and begins to help others by conducting lectures in Spirituality and serving God by doing service unto the Absolute Truth (satsēvā) one may be targeted by negative energies, which try and obstruct one’s spiritual practice. In such a situation, spiritual practice may need to be augmented with spiritual healing by spiritual healers and/or self to hasten relief in case of severe attacks by higher level negative energies. 4. Negative energies can possess healers and pretend to heal through them. We have covered this point in more detail in Basic Principle behind Spiritual Healing. 5. It is best that we do spiritual practice and augment it from time to time with spiritual remedies that are conducted by oneself. Do remember that when one does spiritual practice, then as a by-product the problems that one faces are overcome without even focusing on them. On the other hand, the average healer’s focus is merely on healing a worldly problem with little to no focus on the spiritual growth of his or her patient.